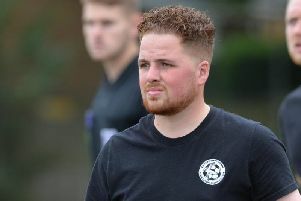 Harborough Town manager Nick Pollard has urged his side to produce a big push as they head towards the back end of the season. The Bees collected their first win in four United Counties League Premier Division matches when they beat Boston Town 2-0 last weekend. And now the boss wants his team to produce similarly strong performances for the remaining 10 games of the campaign. “I’ll be encouraging the players to not let the season fizzle out,” Pollard explained. “We can’t go down and we can’t win the league so it would be quite easy to sit back and drift through. “But, as I’ve said all along, it is about progression for us and the higher we can finish in the league the better it is for us a club. “Maybe the players had one eye on the County Cup semi-final over the last few weeks. “But we’ve now picked up a very good win against an in-form Boston side and that can kickstart our league season again. “People might look at the league table and think Boston would be an easy game. “But they have won three, drawn two and lost one of their last six matches so they are in good form and it was a very professional performance from us. “That’s what we need to keep producing. Harborough will probably have to see out those games without influential midfielder Jack Burrows, though. He suffered a fractured cheek and eye socket in the Boston victory and is unlikely to feature again this season. Pollard added: “It’s a really big blow for us. “Jack is huge player for us both in terms of his playing and his experience. “He dominates that midfield and doesn’t let much come through. “But also, in the very young side that we have, he has that little bit more experience that we are lacking elsewhere. “He’ll be sorely missed but what is important is his health and making sure he is okay before he returns. “We’ve brought in a very good youngster in Costin Tanga-Gibson. He looks a very good prospect but is still only 18. “With the age of our side we really can’t afford to lose Jack’s experience.